alaTest on kerännyt ja analysoinut 109 arvostelut tuotteelle Canon VIXIA HF R60 HD. Keskimääräinen antama arvosana tälle tuotteelle on 4.5/5, verrattuna keskimääräiseen arvosanaan 4.0/5 kategoriassa Videokamerat. Me analysoimme käyttäjien ja ammattilaisten antamia arvosteluita, tuotteen ikää ja muita seikkoja. Verraten muihin tuotteisiin kategoriassa Videokamerat, Canon VIXIA HF R60 HD on saanut alaScore™-arvosanan 88/100 = Erittäin hyvä. Very easy too use, has a great zoom. Can barely see the net our son plays ball behind. So awesome. This video camera is perfect for my needs. It's basic enough that even a tech-challenged person like myself can use it. I love it! This camera is perfect for its size. It's image quality is great. 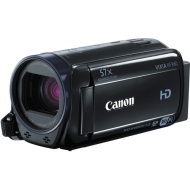 Takes clear video , compact and great for the kids plays, concerts ect. 4 a birthday gift and was greatly surprised. Used it right away. Camera is simple to use. Picture is great and image stabilization is effective. Screen menus are simple to understand. Camera features are user friendly. The camera was easy to set up and it is easy to use. We have used it to video several events. We have also used the features to play back the videos on the camera as well as on our TV both were easy to do as well. My sister loves her new camera. She uses it alot!! The camera is great for the price I paid for it. It is constantly trying to stay focused on the faces that are being recorded. It's nice for a beginner that it stays focused on the faces instead of having to do it myself.